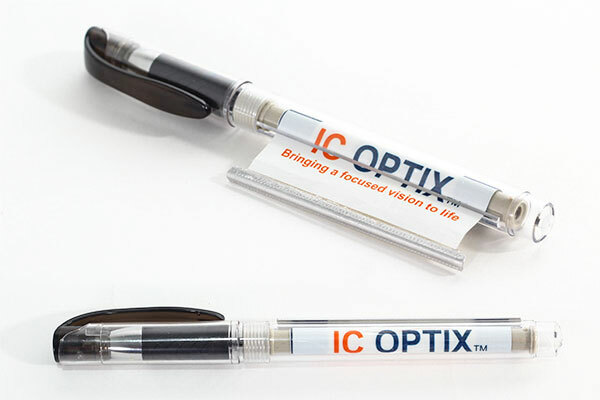 IC Optix patented scrolling magnifier technology lies at the heart of a new and innovative class of convenient vision aids. 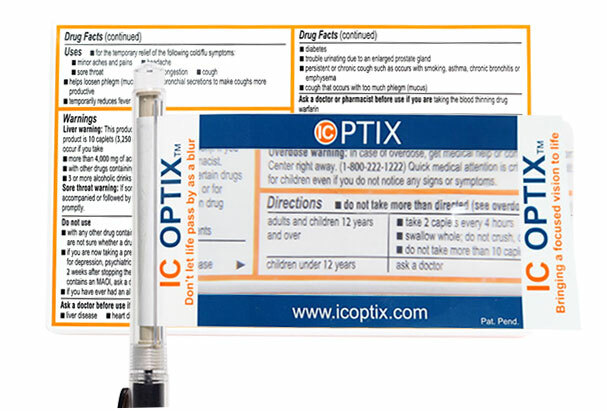 Prior to IC Optix, the primary types of over the counter vision aids included reading glasses and magnifying glasses. Although these types of vision aids provide a good technical solution, they are not always very convenient. Reading glasses frequently break, are often lost, are irksome to stow, change one’s appearance, and tend to be an unwanted intrusion into one’s lifestyle. Magnifying glasses are usually cumbersome and inconvenient to carry around. IC scrolling magnifier devices address the issue of a convenient, durable magnifier that can always be close at hand. The ultra-thin film magnifying lens is so thin and flexible that it can be scrolled onto and off of a spindle in the same way a roller blind works. 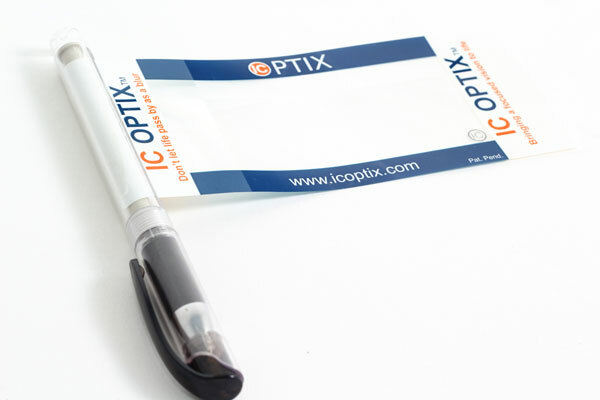 This property allows a large magnifier film to be integrated into everyday objects such as a pen. Most people generally carry a pen in their pocket or handbag, making it a very convenient location for a vision aid. 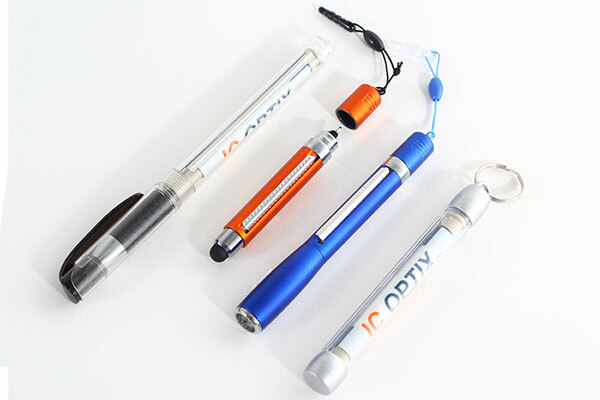 The scrolling magnifier lens can also be integrated into a variety of other items such as a stylus, a flashlight, or a key post. Presbyopia is one of the most common forms of vision impairment in the world. 261 million people in Europe2, 140 million people in the US3 and 1.8 billion people globally4 are in the presbyopic age group of 40 years and older. 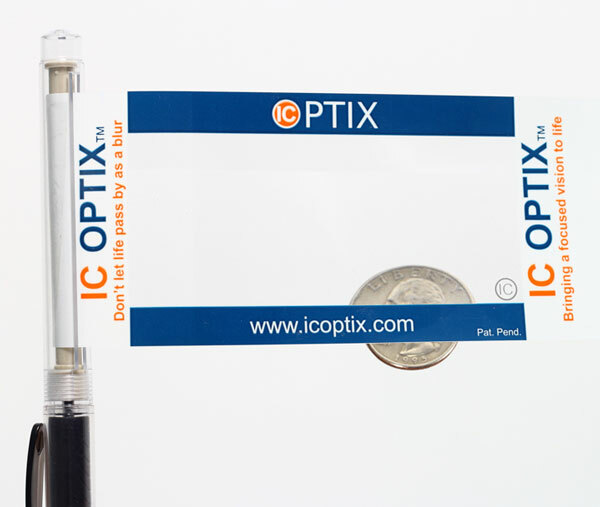 IC Optix - Copyright 2015 - Developed by TR Designs Ltd.